Granular activated carbon multimedia cartridge coupled with Pentek® Big Blue 10" sump with 1" FNPT in/out for faster flow rates. The WECO Big Blue granular activated carbon (GAC) filter is designed for whole house Point Of Entry (POE) residential and industrial filtration applications. The heavy-duty reinforced polypropylene housing holds a 10-inch filter cartridge filled with granular activated carbon. The cartridge uses high-capacity dust-free coconut shell granular activated carbon. Coconut shell activated carbon has a tremendous internal microporous network that removes taste and odor problems caused by chlorine, gases and natural organics like MIB and geosmin. Coconut shell carbon is very hard and does not release black dust particles into the water. Used as a whole house POE filter, the filter will provide taste and odor-free water to every faucet and shower in the home. 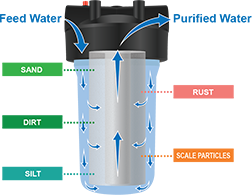 The WECO Big Blue granular activated carbon filter also removes herbicides, pesticides, synthetic chemicals, and volatile organic compounds (VOCs). The filter is also recommended for coffee shops, snack bars, restaurants, and fitness clubs where customers demand healthy taste and odor-free drinking water and beverages. 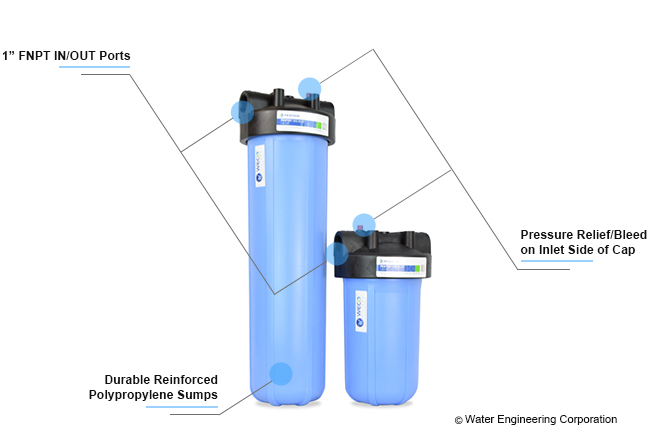 The WECO Big Blue granular activated carbon filter can be incorporated into multi-stage whole house and commercial reverse osmosis systems, water softeners and WECO specialty filtration system. 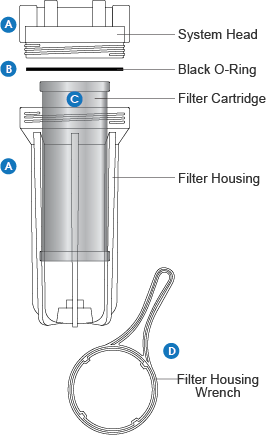 The Big Blue filter housing has 1” female NPT in and out connections that support high flow rates. 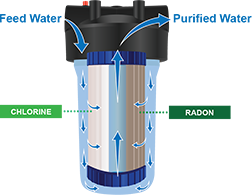 The pressure relief button allows for easy air bleeding and cartridge change-outs. 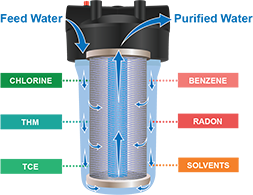 Big Blue filters remove a wide variety of contaminants from residential and commercial water supplies. We recommend a 3-way bypass installation using 3 ball valves. The picture shows the unit in "Service" position. Valves on the left and the right are open; center valve is closed. Water flows through the filter. To bypass, close the right and left valves and open the center. Water flows around the filter. 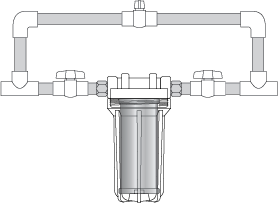 The bypass will work without the right or the left valve, but it's best to have both because it allows isolation of the filter completely from the house plumbing if desired.